One mom is hoping that a pair of intimate portraits will help spread awareness and paint a more complete picture of postpartum depression. 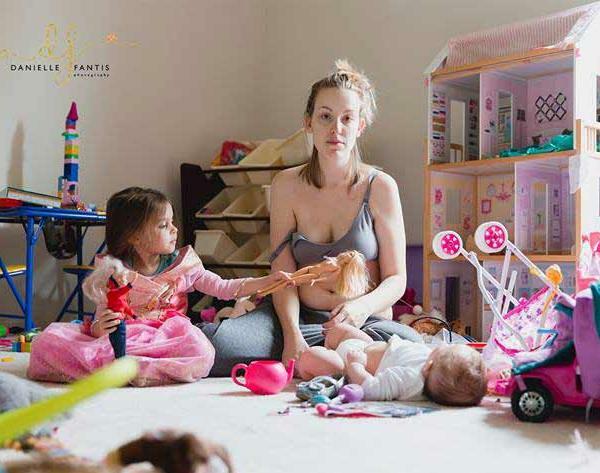 Kathy DiVincenzo shared one image of herself looking disheveled and staring blankly in a messy playroom with her two young children. In the next, she's posed in the same playroom - this time, her hair is done, she's fully dressed, and every toy is put away. "The truth is, both of these pictures represent my life depending on the day. I would only ever comfortably share one of these realities though and that's the problem," DiVincenzo wrote on a Facebook post that's been shared more than 72,000 times. DiVincenzo said she has been diagnosed with postpartum depression, anxiety and OCD. 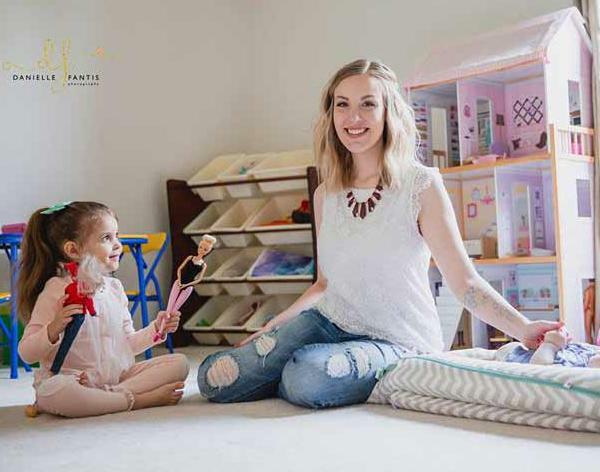 She said she chose to share her story with the encouragement of her photographer, Danielle Fantis Photography, who also experienced postpartum depression. Chances are, you're feeling pretty uncomfortable right now (trust me I am too). I'm going to challenge you to push past the discomfort society has placed on postpartum mental illness and hear me out. May has been declared Postpartum Depression Awareness Month and as someone with diagnosed postpartum depression, anxiety, and OCD I feel like it's time to show you what that can really look like, not just the side of me that's "Facebook worthy." The truth is, both of these pictures represent my life depending on the day. I would only ever comfortably share one of these realities though and that's the problem. The only thing more exhausting than having these conditions is pretending daily that I don't. I work twice as hard to hide this reality from you because I'm afraid to make you uncomfortable. I'm afraid you'll think I'm weak, crazy, a terrible mother, or the other million things my mind convinces me of and I know I'm not alone in those thoughts. We need to stop assuming that the postpartum period is always euphoric, because for 1 in 7 it's not. We need to start asking new parents how they're doing in a deeper way than the normal, "so how are you doing?" that triggers the knee jerk, "everything's great!" response. We need to learn the signs, symptoms, risk factors, and support plans for postpartum conditions. We need to break the stigma and #EndTheSilenceby sharing our stories and letting others know they're not alone. If you have had a postpartum mood disorder please share your story below, or simply post to show you can relate. Let's show others that they don't have to suffer in silence. In case no one has told you, you're doing an amazing job. You are loved and you are worthy. You're not alone. Information to local and national support will be in the comment section. I know how unbelievably hard it is to reach out, but I promise you it is worth it. YOU'RE worth it. Thank you to my close friend Danielle from Danielle Fantis Photography, a fellow mom that struggled with ppd, for capturing these images for me and encouraging me to share them with you.